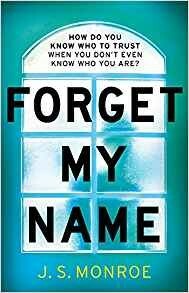 Sensational was the publishers’ description for Forget My Name, and they were bang on target. From the title the plot sounded as though it took place on relatively familiar thriller ground. Well, the novel might start there, with robust writing, but this well-structured and pacey thriller gradually leads the reader off what initially seems a beaten track and into an unfamiliar and horrifying terrain. When ‘Jemma’ (as the protagonist comes to be known), knocks on the door of her own cottage, she has to break the news to the two strangers who greet her, that she can’t remember her name and recalls very little else save that she lives here. She has just returned to Britain from Berlin, with no identifying details (as her handbag was stolen at the airport). The strangers take her in, befriending her, but that’s where Jemma’s problems begin. Do they live here or does she? They can’t both be right. The main action of this novel takes place in four days, but there is a great deal of action packed into this short time, leading from the first knock on that door to a truly horrifying climax. This follows our pseudonymous authors’ best-selling Find Me.